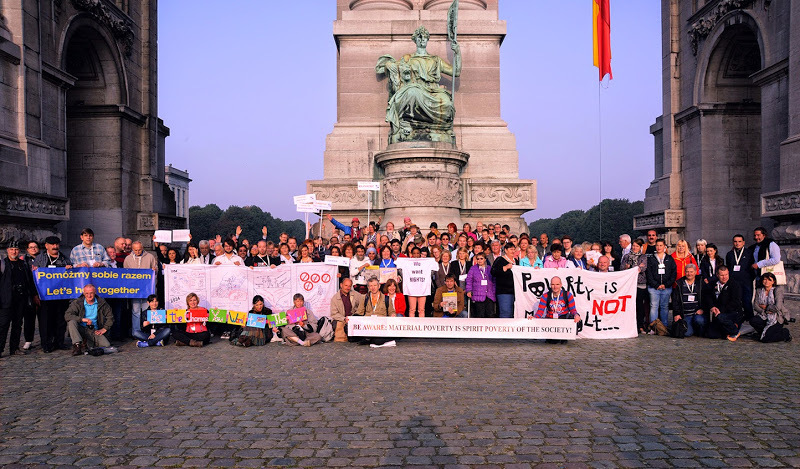 The 13th Meeting on “Funding the Fight against Poverty” took place in Brussels from 22 to 24 September 2014. It gathered delegations of people with direct experience of poverty from 31 different national delegations to address and exchange with EU decision-makers. Delegations gave a series of recommendations from the national delegations on how to fund the fight against poverty and invest in the EU Poverty-Reduction Target, topic of the meeting. The meeting also included intense discussions on 5 thematic workshops on Minimum Income for a Decent Life, Homeless not Hopeless, Youth and Poverty, Combating Poverty and exclusion of Migrants, Wealth and Inequalities and the Fight against Poverty. The 2014 Meeting was an opportunity for rich and useful exchanges and provided a goldmine of information related to the topic of this year’s Meeting. See below a short video of testimonies, the event’s press release, the general report of the Meeting, the 10 key Messages from the Delegates of the Meeting and all other related reports that made this Meeting an extremely rich and useful event. Michael from Austria, Pedro from Spain, Paul from Belgium, Rita from France, Ann from Ireland, Douhomir from Bulgaria and Rolf from Sweden offered part of their time at the 2014 Meeting of People experiencing poverty to share some of their experience and views on how things have evolved for them in the last years. Voices from the ground are all the more valuable as they tend to be heard less and less by policy makers. See Projects and approaches that give ideas and inspiration for effective use of Funds, including EU structural funds, to fight poverty and social exclusion – Drawn from the preparation work for the 2014 European Meeting of People experiencing Poverty. Report of the recommendations and questions from the Thematic workshops on Minimum Income for a Decent Life, Homeless not Hopeless, Youth and Poverty, Combating Poverty and exclusion of Migrants, Wealth and Inequalities and the Fight against Poverty. The European Meetings of People experiencing Poverty have played an important role in driving the development of the direct participation of people experiencing poverty. The European meeting is a key visible moment in this process but more importantly it acts as a catalyst for national processes and national meetings of people experiencing poverty. The European Meetings have been well documented and positively evaluated for their impact on the delegates and the guests who attend. The first of these meetings was organised by the Belgian Government in 2001 as part of the EU inclusion process launched by the Lisbon European Council (March 2000). The meetings continue to contribute to key EU processes including the follow up of the poverty target of the Europe 2020 strategy and the EU Social Investment Package. The meetings have helped to keeping poverty and social exclusion visible in the European agenda. They have contributed to some key areas of policy development such as adequacy of minimum income, child poverty, housing and homelessness, indebtedness, the links between discrimination and poverty (particularly the realities for Roma community), and the impact of liberalization on public services. The meetings help to put faces to the realities behind the numbers of people experiencing poverty, including the different realities for women and men throughout the life cycle. In addition the meetings provide a ‘barometer’ in relation to social and economic developments in Europe. The processes associated to this meeting assist in the journey from ‘people experiencing poverty’ to ‘activists with direct experience of poverty’ and past participants are now playing important roles in anti-poverty organisations. WHO ARE THE MEETINGS FOR? To empower the delegates in their journey from People experiencing Poverty to Activists with direct experience of poverty engaged in their communities and organisations. To strengthen the participation of people experiencing poverty in Anti-Poverty NGOs and relevant policy making processes at local, national and EU levels. To facilitate exchange and learning and to stimulate further exchanges and joint projects.